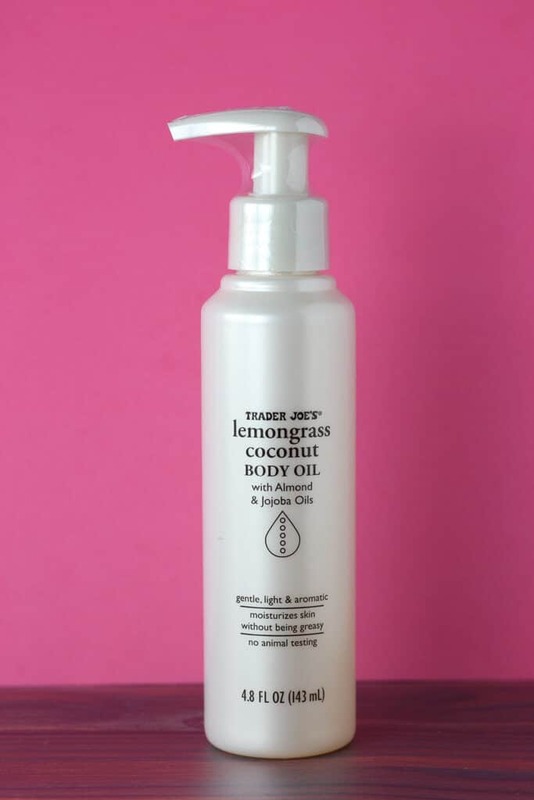 The pros: Trader Joe’s Lemongrass Coconut Body Oil is nicely moisturizing, has a sugary sweet aroma, and absorbs well into skin. The cons: Fragrance might be natural but is not for everyone. That is what this smells like the first time I put it on. The next time I put it on I had my husband smell my arm. OMG, It smells like Lemon Pez and I haven’t smelled that in years. That was my husband’s response. So, if you can get past the cloying sweet aroma that is more appropriate for Dylan’s Candy Bar than something sophisticated, then here is an item I’ve overlooked on countless occasions in the health and beauty aisle. With the heat, humidity, and going in and out of air conditioning has left my skin more dry than usual. 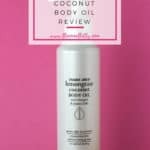 I have my share of chronic dry patches that a regular lotion doesn’t seem to address. While I think this would be better suited to winter time use, it left my skin soft even after showering. A little goes a long way here. This is all oil. At 70 degrees it wasn’t solidified like the bottle warned. But for an oil, I don’t end up feeling greasy. I’d probably only use this item on my body and not my face as the smell here is quite strong and far more pronounced than say the seasonal Trader Joe’s Rose Facial Oil. For $3.99 it’s inexpensive and something that you might not have noticed on shelves. If you can get past the candy sweet smell, it is a really nice moisturizer at a bargain price. Would I buy this again? 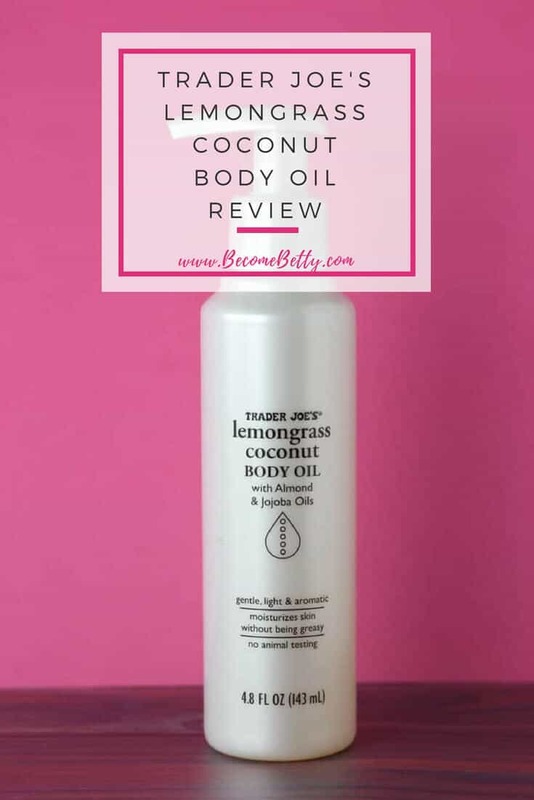 While Trader Joe’s Lemongrass Coconut Body Oil will last me a long time, I would buy this again. TJ’s always bring the exciting scents! Like blueberry acai body scrub that smells so good that it is so tempting to eat it (I KNOW NOT TO EAT IT!) and their candles. So natural smelling! Hey Alek! I bought that for my sister, but haven’t bought one for myself. I think I should go pick this up on my next trip to Trader Joe’s. Thanks for the suggestion! Hey Ttrockwood! I don’t think I could handle the smell of this product on my face. The rose oil I could handle, but this was a bit too strong. Thanks so much for stopping by and sharing! Oh my gosh I haven’t seen this product yet. I like the smell of lemongrass but I can’t recall ever having smelled lemon Pez. I just might need to buy a bottle. I am going to buy their HLA serum soon. I’ve heard good things about it.and I’ve used other HLA serums in the past and really like them. Hey Dag! This product isn’t new, it’s just easily overlooked. I think I’m going to get to the serum soon too. I’ve also heard good things about it as well. It will be interesting to see how it is. All I know is that it’s cheaper than my Sephora habits. Thanks so much as always for stopping by! Remember few days ago you posted about the tragic story of a TJ’s manager passed away from the horrific hostage scenario? One of the employees at a TJ’s near where it happened explained on Instagram that Trader Joes will pay for the all of the funeral and the burial expenses. Plus the employees at Silver Lake are still getting paid even the store is temporarily closed and give them time to grief. It shows that Trader Joe’s is going above and beyond; not many business offer that kind of support. Hey Alek! I remember posting it. That is very generous of them and I know a lot of companies might not be as generous. It’s also extremely thoughtful of them to pay the employees while the store is lose. Thank you so much for sharing this. It’s really a wonderful update! I just bought this for the first time and I fell in love instantly. I love the spicy lemongrass aroma so it’s perfect for me. I always have dry skin in the winter and this is probably going to be my go-to when I need a quick spot of moisturizer during the day. Hey Lido! Glad to hear you enjoyed it as much as I did. Thanks for taking the time to stop by and share yorur thoughts on this! Hey Allie! Thanks so much for stopping by and sharing your experience. I’m glad to hear that you enjoyed the fragrance as much as I did too. Hope you’ll stop by and share your experiences here again. Loved this oil during the summer as it absorbed quickly and kept the mosquitoes away! I still have two bottles so I will continue to use it into the colder months and enjoy the citrus smell all year round! Hey Michanna! I didn’t know the mosquito aspect! But then again this is the first year I didn’t get bit. I couldn’t agree more about using it over the colder months. Thanks so very much for stopping by!